Eight-year-old Martin Richard was killed in the attack, and his mother and sister suffered grievous injuries. Two bomb blasts, 12 seconds apart, rocked the finish line of the 117th running of the Boston Marathon Monday, killing at least three people, including an 8-year-old Dorchester boy, wounding more than 140, and leaving the sidewalks of Boylston Street covered in blood. Medical professionals on hand to care for blisters and sore knees in Copley Square suddenly found themselves treating life-threatening lacerations and lost limbs, as a high holiday in Boston, Patriots Day, turned into an epic tragedy. Emergency workers rushed to the scene, despite the very real possibility of more blasts. The explosions blew out windows, sent plumes of smoke into the sky, and left victims piled on each other in a scene far more reminiscent of a battlefield than a celebrated day in Boston’s Back Bay. 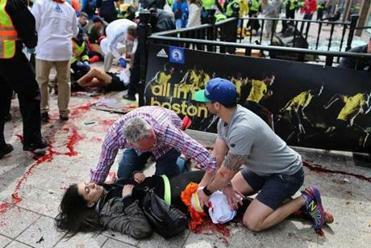 The blasts occurred at 2:50 p.m., several hours after the elite runners had finished the race. About 30 people were transferred to hospitals under a Code Red, meaning life-threatening injuries, which may point to a rising death toll, said a law enforcement official. Flags were lowered to half-staff in Washington, D.C., and around the nation, as the country mourned with Boston. 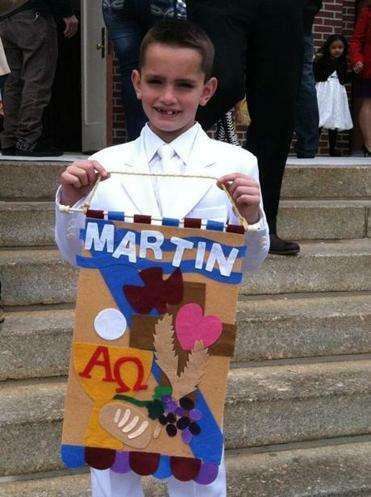 The grief resonated sharply in Dorchester, where residents gathered Monday night at Tavolo Restaurant in memory of 8-year-old Martin Richard, who was killed in the attack, and his mother and sister, who suffered grievous injuries. Martin’s father, Bill, is a community leader in the Ashmont section of Dorchester. A third child was reportedly uninjured. A massive investigation was underway Monday night under the direction of the FBI, as much of the Back Bay was locked down to protect the sprawling crime scene. Last night, officials called the investigation “very active and fluid.” Authorities were questioning at least one person at Brigham and Women’s Hospital, said sources familiar with the situation. Police Commissioner Edward F. Davis said no one was in custody. The person questioned in the hospital was a Saudi national, who was reportedly tackled and held by a bystander after he was seen running from near the scene of the explosion, said a law enforcement source who spoke with someone involved in the FBI’s investigation. The Saudi man, believed to be a university student in Boston, is cooperating with the FBI and told agents that he was not involved in the explosions, and that he ran only because he was frightened. Investigators did not characterize the man as a suspect. No one had been arrested or charged by late Monday night. Hospital officials said late last night that tests showed no radiation or biological agents on the victims. Although many people were wounded by flying shrapnel, it did not appear the bombs had been packed with nails or other fragments to increase the injuries. Twitter and the Internet overflowed with rumors in the aftermath of the blast, some of which were later debunked. Law enforcement and city officials disputed published reports that investigators had discovered one or more bombs that had failed to explode. Law enforcement officials also descended late Monday on a high-rise apartment building in Revere and conducted a search related to the investigation, said an official with knowledge of the search. A woman received help at the scene of the first of two explosions on Boylston Street Monday. Medical workers at the finish line treated life-threatening wounds and losses of limbs. FBI and Homeland Security agents were seen entering the Water’s Edge apartment complex at 364 Ocean Ave.. The several police vehicles gathered outside left the scene before midnight. The Revere Fire Department was called in to assist State Police in the search of an apartment unit of a “person of interest,’’ according to a statement from the department. A city touched 11 years ago by terrorism, when 9/11 hijackers took off from Logan Airport, was touched again, in a plot to inflict untold casualties at the city’s annual Marathon celebration, the one day each spring when the attention of the sporting world is on Boston. The attack truncated the world’s most prestigious road race, which draws runners from across the globe, and will forever mar what is annually the city’s most uplifting day: Marathon Monday. 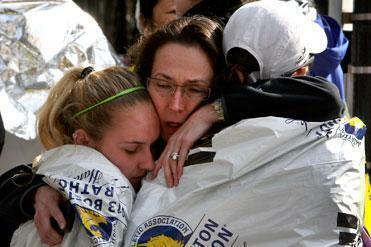 Marathon officials and police immediately ended the race after the explosions, turning runners away from Copley Square. Officials told television viewers to stay out of the city and asked runners and spectators to go home or back to their hotels and avoid gathering in crowds. The aftermath of the tragedy is expected to be felt across the city Tuesday. Governor Deval Patrick, who provided updates through the afternoon and evening, said the blast area is expected to be closed Tuesday. He said Boston “will not be business as usual,” after the terrorist attack and that police presence will be heavy in the city. MBTA riders can expect random bag searches. The closed-off area spans the length of Boylston between Berkeley Street and Massachusetts Avenue, and on either side of Boylston from Newbury Street to Huntington Avenue, a section nearly a mile long and three blocks across, he said. Investigators faced an overwhelming crime scene, littered with bags dropped by people fleeing the blasts. Police had to treat every backpack and gym bag as a potential deadly threat. Authorities blocked cellphone service to the area to prevent any other device from being detonated by phone, leaving thousands of athletes and spectators unable to call loved ones to make sure they were OK.
Police locked down a 15-block area around the scene of the attack, in the heart of the Back Bay neighborhood. State Police sent units to every hospital in the city and to South Station to provide security and swept the State House for bombs, as a precaution. Eyewitnesses to the blasts reported a sudden shock, followed by unreal scenes of human carnage. Ron M. Walls, chief of emergency medicine at Brigham and Women’s, said the hospital had received 26 of the wounded. The youngest was 3 years old and was sent to Children’s Hospital; the oldest was 62. A US Immigration and Customs Enforcement officer was among those who sustained less than life-threatening injuries from the explosion, said a federal law enforcement official with direct knowledge of the information. The officer was off duty and was watching the race with the rest of the spectators. He was taken to a hospital for treatment. The Patriots Day holiday is steeped in Boston sports tradition, when the Red Sox play a rare morning game at Fenway Park, and the best runners on the planet race from Hopkinton to Copley Square, on a 26.2-mile course lined by millions of cheering, celebrating fans. As part of the prerace security stepped up since the 9/11 terrorists attacks, Boston police had swept the streets for explosives, said State Police. Relatives of those killed in the Sandy Hook school shooting massacre were guests at the finish line tent, near where the bombing occurred; a theme of this year’s marathon was “26 Miles for 26 Victims,” referring to those killed in the Newtown, Conn., shooting. Hours after the blasts, on the outer edge of the Boston Common, across from the Public Garden, Royal Courtain was with his wife, Cindy, as heavily armed police and SWAT officers with automatic weapons entered the Common. Courtain was about 100 yards from the finish line when the explosions occurred. Cindy had just finished her first Boston Marathon. He paused and covered his face. “Some missing legs.” After the worst 30 minutes of his life, Courtain got a call from his wife saying she was unhurt. “What was intended to be a day of joy and celebration quickly became a day in which running a marathon was of little importance,” the BAA said. Travis Andersen, Billy Baker, Brian Ballou, Laura Crimaldi, Kevin Cullen, Carolyn Y. Johnson, Kay Lazar, Shelley Murphy, Maria Cramer, Michael Rezendes, Maria Sacchetti, and Lisa Wangsness of the Globe staff and Globe correspondents Derek J. Anderson and Todd Feathers contributed. Mark Arsenault can be reached at arsenault@globe.com.